When an incident occurs, a video clip can tell a story that can add thousands of dollars to the bottom line when combined with systems data. Not having that picture can cost a company greatly. We build our video surveillance systems with the unique needs of restaurant, retail, education and enterprise customers in mind. Our video surveillance equipment includes HD and CCTV cameras, IP surveillance cameras and remote surveillance on desktop and mobile devices. With the video solutions offerings in our portfolio, we can provide systems from 1 to 1000 cameras that are IT-friendly and offer mobile support and cloud-based exception reporting. The VMAX A1 is the simple way to upgrade an existing analog solution. This DVR can be integrated into an existing application without the need to update the cameras at the same time, allowing for financial flexibility and ROI. It supports all HD over Coax formats and all Analog to 960H, offering a seamless upgrade to the detail and clarity of HD resolution. The VIGIL™ V3000-, V5000-, and V7000-Series of digital video servers are fully integrated intelligent video appliances. Pre-configured with VIGIL Video Management System (VMS) software, the V-Series high-performance digital video servers represent a cost-effective video management platform that is not only easy to deploy, but easy to expand upon. Flexible in design, the VIGIL V-Series allows users to deploy a system that addresses their current needs with the ability to scale up to meet tomorrow’s demands. Up to 12TB of on-board storage. The VIGIL™ V5300, and V7300-Series of Network Video Recorders (NVR) are fully integrated intelligent video appliances. Pre-configured with VIGIL Video Management System (VMS) software, V-Series high-performance NVRs represent a cost-effective video management platform that provides ease of deployment and scalability. Up to 40TB on-board storage. The VIGIL™ V250 Series of Network Video Recorders (NVR) are fully integrated intelligent video appliances. Pre-configured with VIGIL Video Management System (VMS) software, V-Series high-performance NVRs represent a cost-effective video management platform that provides ease of deployment and scalability. This series includes 4 to 8 PoE powered ports for your IP devices. Up to 8TB of on-board storage. The DIVAR IP 2000, 6000 and 7000 series is an affordable, simple and reliable all-in-one recording, viewing and management solution for network surveillance systems of up to 128 channels (with 32 channels pre-licensed). Running the full Bosch VMS (Video Management System) solution and powered by VRM (Video Recording Manager) software from Bosch, DIVAR IP solutions are intelligent IP storage devices that eliminate the need for separate NVR (Network Video Recorder) server and storage hardware, reducing the total cost of ownership by as much as 45%. The tower or 2U rack mount unit combines advanced management and state-of-the-art recording management into a single cost-effective, plug-and-play IP recording appliance for IT-minded customers seeking a state-of-the-art “second generation” NVR recording solution. This solution allows integration with both intrusion and access control. Video surveillance has several benefits, but designing the right system for your organization can be complicated. 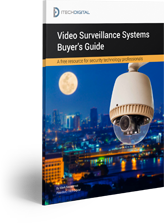 Take a crash course in the technology and terminology in our buyer’s guide to video surveillance systems.